Here is my roundup of iPhone Apps that I use for meditation and relaxation. Health through Breathing-Pranayama: This is a paced breathing app that I use everyday for meditation. I like it better than Breathing Zone because you can customize the breathing rates and it has better sounds/music. Like Breathing Zone, you breath in and out to the rising and lowering of the music. You can customize the session length, breathing pattern, and timing which affect the total breaths per minute. It also has presets for Beginner, Intermediate and Advanced. This is my favorite overall App for relaxing and meditation. Mind Wave 2 : Isochronic Version This is a portable audio-only mind machine with presets for different issues from anxiety to insomnia. All the tones are Isochronic which according to experts like David Siever who created the DAVID PAL mind machine (see this post) are more effective than the binaural tones because the entrainment beats are produced outside the brain and are more pronounced. You don’t need stereo headphones to use this App but it is more effective with them. Mind Wave 2 is audio-only and does not have a flashing screen for photic entrainment. It is still effective for me and I use it if I am on a trip and cannot sleep. There are 24 presets and it allows you to listen to music while it is playing. However, I think it is more effective without any music or other distractions. Breathing Zone: A great little app that I thought could be a replacement for the Resperate device I use to lower blood pressure. It has a clean interface and it measures your existing breaths per minute using the built in iPhone microphone. You have to put your mouth close to the microphone for it to get an accurate reading . A couple of times it was way off , but once I moved the microphone close to my mouth it did a better job. After it determines your breathes per minute(bpm), it starts you at that rate and then ramps down to the ideal bpm for relaxation and lowering blood pressure. You can watch the pulsing “flower”screen and/or listen to the rising and falling of the music, inhaling when the music pitch rises and exhaling as it descends. I recommend closing your eyes as you get a much better relaxation effect. The major disadvantage of this app is that it does not measure your breathes per minute in realtime like Resperate. Considering that Resperate is a $300 device and Breathing Zone costs $2.99 I would try this app first to see if it helps. Mindfulness Meditation: I just started doing this type of meditation which involves no music, and requires one to be actively present. This app has 5, 10,15, 20, and 25 minute settings that use a guided voice to get you started. Most of the meditation is silence. I like how the voice comes in every once in a while which “wakes me up” and allows my mind to refocus when I start to doze off . The voice brings me back to the awareness of my body which is what mindfulness is all about. Relax Melodies Premium Edition – (sleep & meditation & yoga & relaxation helper): A reasonably priced ($1.99) app that has over 50 built in sounds and noises, that you can layer by clicking on little icons. 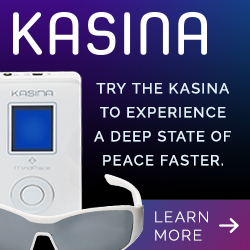 Surprisingly, it also has built in binaural tone generator with settings for different brainwave states. You can also combine different sounds with the binaural tones. Right now I have the 20Hz beta focus binaural tones combined with with wind chimes and rain sounds. You can combine as many sounds as you want and it is works great if you have problems sleeping. Progressive Alarm Clock + Dream Journal: I use this to replace my alarm clock. This app is great if you hate waking to the jarring sound of an beeping alarm clock or radio station. It has 10 built “Singing bowl sounds” that are actual recordings of the bowls. I like the progressive wake feature which gradually raises the volume and frequency of the bowl sound over a user defined period of time. If you have ever heard and enjoyed the sound of Tibetan signing bowls you will love this app. It also has a journal feature for keeping a dream diary. Iphone Apps for meditation and healthy living.